Are you as excited about this new blog as I am? Boy I am excited! The more I work on it, the more features I find that are exactly what I wanted! For example, the “Related” posts at the bottom of each page. Aren’t those just the coolest links! I am also super excited about the Recipe Index. If you haven’t already seen it, go check it out! From the time I started my blog back in 2012 I always wanted a recipe index with pictures. I never knew how to make one, however, so I just had the text links. I took a web design class almost a year ago now, and learned a lot about creating links. I never thought about it in terms of my Recipe Index though. Just last I had a stroke of inspiration, and knew exactly how to get my picture links! I worked hard, and you will reap the benefits. I am beaming right now. I really do hope this blog is as great for you as it is for me. If you ever have problems, make sure to let me know so that I can fix them. I have great plans for this blog, and I want it working at it’s best! I am really getting into lunch recipes lately. I need great ideas for sending to work with Limi, and things that can go in the Munchkin’s lunch box. I have also been doing lunches differently when the munchkin and I are at home. We are eating lighter, produce-filled lunches, and it is great! I saw this sandwich Monday evening, as the munchkin and I were looking through The Friend magazine. 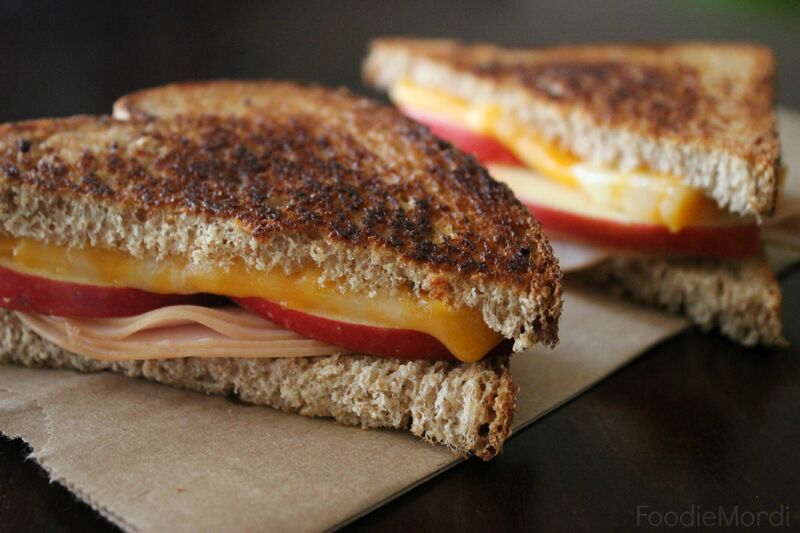 I love apples and cheese, and it sounded like a great idea to put them on a grilled cheese sandwich with the addition of turkey! I was not disappointed at all! I am actually not the biggest fan of regular grilled cheese sandwiches. They are good, and I will eat them, but I don’t make them frequently because there isn’t anything super special about them. These Apple Grille’s, however, are awesome! Cheese and turkey, pretty good. Add the apple and it takes it over the top! I LOVE them. I cut my own cheese slices from a blog of Colby Jack cheese. They were long and skinny, so it took 4 slices to cover one piece of bread. If you use a different kind of cheese, or pre-sliced cheese, you may not need as much cheese. Preheat a pancake griddle to 350 F. Butter one side of 4 pieces of bread. Place the butter side on the griddle. Lay 4 slices of cheese over each piece of bread. Lay apple pieces over the cheese, and with 4 pieces of turkey per slice of bread. Put the remaining 4 slices of bread over the grilling stacks. Butter the top side of the sandwich, and flip the sandwich to brown on the other side. Once browned, remove from the griddle and serve.